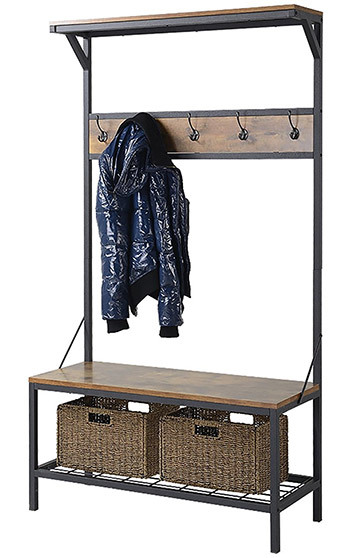 The hall tree’s coat rack/storage combo is just awesome. You can never have too much storage and this goes double for a hallway. But if you’re not sure where to start looking for a hall tree then keep reading. 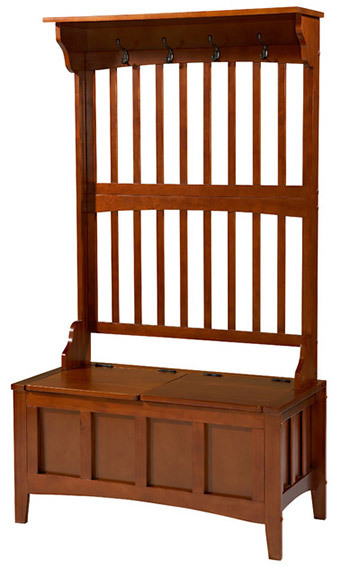 I’ve researched dozens of hall trees and through that research I found the Homestar 3-shelf design to be the best. But there are so many great options that I couldn’t whittle this down to just one! So I’ve curated the absolute best hall trees I found each with different styles, sizes, and storage options. In this post I’ll review the benefits of each one and hopefully help you decide on a hall tree for your home or apartment. Since a hall tree is meant to hold your clothes it should be very sturdy. This means a strong build with quality wood or metal for the legs & frame. But the build isn’t the only consideration you should think about. You’ll also need to measure the room to make sure you have enough space for a hall tree. Or to rephrase, you’ll want to see how much space you have available. Do you need 6 coat hooks or can you get by with 3? Do you want flip-up bench storage or is that not so important? Do you want a mirror on your hall tree? Only you can answer these questions and they’ll influence which unit you get. The price will also come into play but I’ve found most hall trees are comparable in this area, so really you can’t go wrong with anything I’ve reviewed in this post. Keep in mind that most of these do require some assembly but I’ll mention which ones are easier vs which take more effort. For the most part these can all be a one-person job so the construction isn’t a big concern. So take a look over these picks and see what you think. If you know what features you want and what budget you have then you’ll find a great unit in here for sure. My top pick from all the units I researched is the Homestar 3-Shelf Hall Tree. Why? Quite a few reasons but I think the most significant is its simple design that can match any hallway. Whether you’re in a small apartment or a four-story home this hall tree isn’t too big, nor too small, and should blend nicely with the room. The wood does feel like solid wood but it’s likely particleboard with a wood veneer. Either way it is sturdy and unlikely to chip off. I’m actually surprised this is so sturdy considering the price. Just note the bins you see in the photos are not included with this hall tree. If you want to add bins onto the bottom wire shelf you’ll need to grab those separately. But that bottom rack can be used for shoes too since it’s got plenty of clearance under the seat and it’s easy to reach. I’m also giving this unit points for the very top of the hall tree which acts like another shelf. 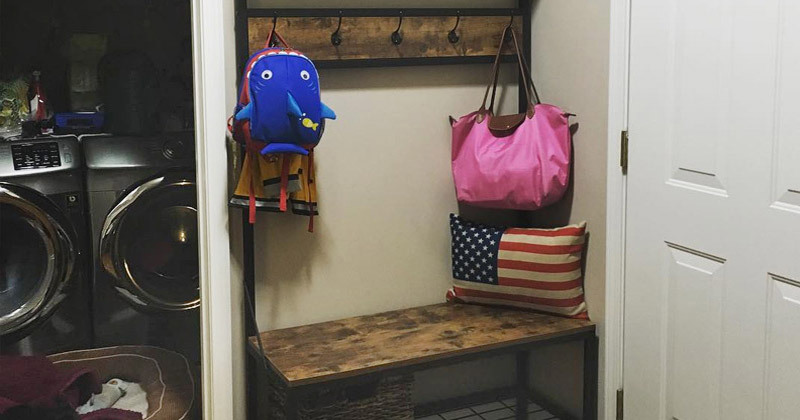 It’s about 6 feet off the ground so your kids won’t be able to reach up there, but that top shelf can work nicely for displaying room decorations or a small clock or whatever you want. Overall this is my favorite piece and it’s my suggested pick for most shoppers. But if you don’t like the design or if you want more features then read on. These are close runner-ups to my best pick and they’re also the simplest. Later in this post I’ll go into more detail on related models like hall trees with mirrors and corner trees. Many people just want a simple design that blends nicely and fits in the room. Nothing too fancy but nothing too bland either. I’ve got ya covered with these top picks including a list of pros & cons for each one. You’ll notice the WE Furniture 72″ Hall Tree feels very similar to the Homestar design. In fact they both measure very closely at 6 ft tall and just over 3 feet wide. Both have similar wood finishes and they both have similar metal frames. The difference comes in storage and style. This We Furniture hall tree uses MDF instead of particleboard. They’re closely related but MDF tends to be a little heavier. Although the wooden pieces aren’t very large you shouldn’t have trouble piecing this together. Because of this slightly heavier MDF board the hall tree is incredibly sturdy and one of the strongest you can get. Load up every hook with a coat and you’ll never see it budge. A couple advantages on this one over the previous hall tree: this offers 7 hooks over 5 and this has slightly more space underneath for shoes/baskets. But 3 of those hooks fall underneath the top row which means long-hanging coats will fall over them. This might be an annoyance if you have to reach under other coats to get yours. It’s one distinct difference from my top pick of the Homestar unit above. Yet since they’re both designed in such a similar way this is a tough choice. I was close to making this my #1 pick but I chose the Homestar because it has the top shelf and is a bit cheaper. Still I love this hall tree because it can blend anywhere. If you like the extra hooks and don’t mind the price tag then go with WE Furniture’s design. The Boraam 19016 Carolyn Hall Tree is absolutely gorgeous and designed from a unique tropical hardwood called rubberwood. This material is one of the more eco-friendly options so that may factor into your decision too. But for actual quality this thing is great. Measures about the same as other hall trees with 6 feet tall and just about 3 feet wide. 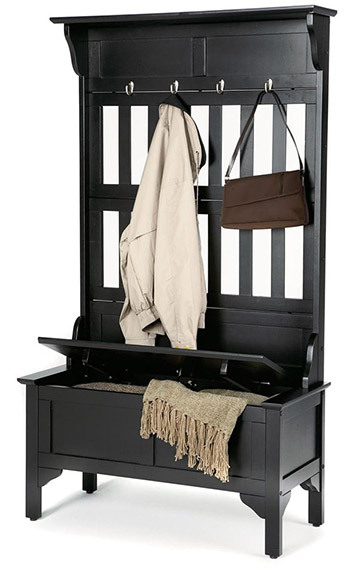 This offers plenty of storage with four coat hooks and a few shelves as well. Each hook includes one “main” hook along with a smaller one underneath. I wouldn’t count these as double hooks but they work great for holding smaller items like keys or hats. One thing I really like is how this unit ships with two baskets for the bottom storage spaces. These baskets are wrapped into the price so you’re not paying anything extra to fill up those cubbies. Assembly is a breeze and should take no longer than 30-60 minutes. Anyone could get this together by themselves so it’s great for bachelors or bachelorettes in smaller apartments. On the negative side I didn’t find this super comfy to sit on. It works for temporary seating if you’re tying your shoe or waiting on someone for dinner. But it won’t feel like the roomiest place to pop a squat. The storage may feel limiting as well because the bottom area has a fixed wooden divider between the cubbies. So these only work as cubes rather than one large rectangle, and that may not offer much room for things like shoes or scarves. Really this comes down to personal preference. If you like those cubbies and the overhead storage, and if the color matches well, then definitely consider this unit for your home. This hall tree should appeal to anyone who wants open space in the design. It does not have any backing area so most of the structure uses a metal pipe design with some wood pieces for seating and under storage. 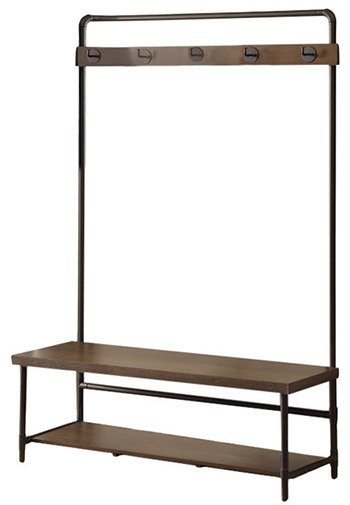 This Industrial-Style Coaster Hall Tree comes in a dark black design with coffee wood accents. It ultimately feels like a darker piece and would go nicely against a lighter wall. Even though it doesn’t have any upper shelving it still measures close to the usual 6 feet tall leaving plenty of space for coats to hang down. For the width it totals about 4 feet so be sure to measure your space before buying. Really I think this design comes down to one word: simplicity. It’s not very detailed and certainly not the “typical” hall tree you’d expert to find. It’s got a sturdy design and 5 strong coat hooks that curve at a 90 degree angle. That’s about it. No extra shelving, no storage bench, nothing else. 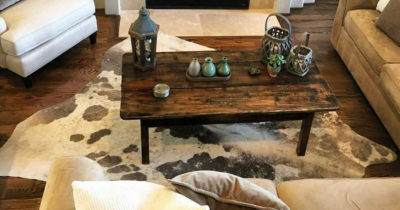 If this is the type of piece you’re looking for then Coaster Home Furnishings is a quality choice. Although I realize this minimalist design may not suit everyone so it won’t appeal to a wide audience. 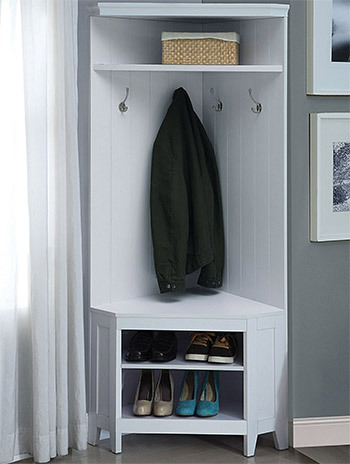 If hidden storage is on your list then you’ll want to a hall tree with flip-up storage space. I can’t say which style works best since there are so many sizes, materials, and colors. But these are my top picks for the best storage bench hall trees so take a look at see what you think. This is one of the few all-black models I found and it is by far the best in this color. The Home Style 5650-49 measures a little smaller than most with about 5 feet in height. The entire thing is made of a strong asian hardwood so there’s no metal in the frame at all. Each hook is made of brass and finished with a glistening silver. And you can’t tell just by looking at the picture but this does have a storage bench area. It’s all one big lid and the space can feel a tad smaller than others, but it’s still plenty of storage for umbrellas or extra clothing. The only reason this space is smaller is because the unit is designed for extra under-area space. This way you can keep shoes under the hall tree and even place a mat there if needed. Perhaps the biggest complaint on this unit is the setup process. It’s not so much the instructions, but rather the difficulty of getting pieces to line up just right. Each section has its own assembly method so you’ll have to put together the back, base, and storage area individually before combining them all. Many of the pre-drilled holes just do not line up right away so you’ll do a lot of shuffling to get it all in place. I would actually say the instructions for this are better than others(surprisingly). It’s just the physical setup process that’ll take the most effort. Still if you’re looking for a black hall tree and don’t mind the setup time then for sure look into this model. One thing I like about this Linon Hall Tree is the smaller size. It measures closer to 5 feet tall and the depth hits about 1.5 feet from the wall. It feels a lot closer to the ground and works a lot better in places with low ceilings. 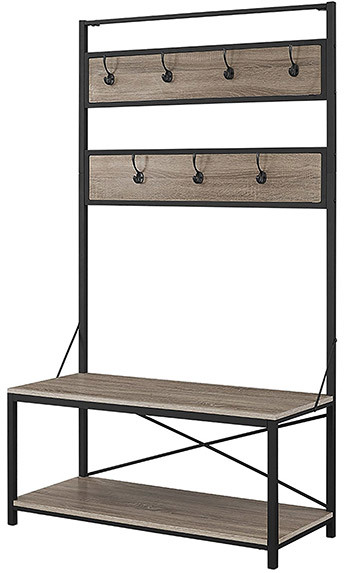 Yet despite its size this thing is still tall enough for hanging coats, hats, scarves, or really anything you need. The center bench area splits down the middle with two lids on separate hinges. This way you can access the storage area even if someone is sitting on it, or if you’ve got items strewn across the surface. But the interior storage space is still one big area so you get full access to the space from either lid. The seat measures about 18″ off the ground so it’s about 1.5 feet in height. This doesn’t feel too low and it makes a great place to hang out waiting until your family is ready to leave. Unfortunately my biggest complaint is the setup process because of the shoddy instructions. They only show pictures instead of step-by-step directions. No idea why since this is pretty frustrating for people who’ve never put furniture like this together. But just like most “assembly required” purchases, once you get this together you’ll be glad you got it. The wood is pretty strong and the color is a deep cherry finish. I’d call this a specialty unit where it certainly won’t work for everyone. But if this meets your criteria for a hall tree then don’t hesitate to pick one up. Plenty of hall trees come with mirrors and they all vary in size & shape. Many of these mirrored hall trees even have storage benches and extra hooks. Go figure! 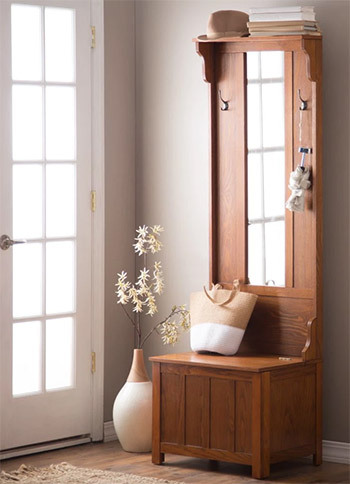 If a mirror is crucial for your hall tree purchase then read on. I’ve curated the best ones here with details about each style. This gorgeous espresso hall tree is one of the most feature-packed I found. 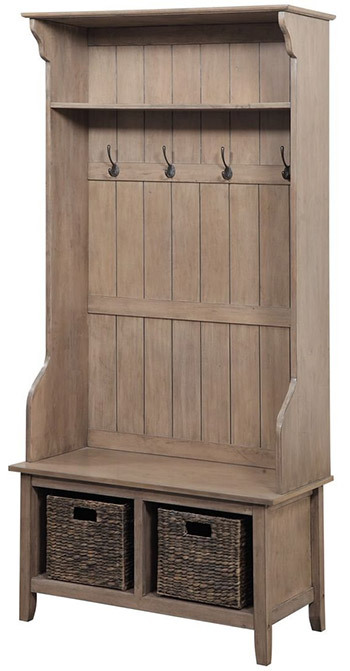 The Belham Living Lynden Hall Tree comes with 3 double-hooks for a total of 6. Each hook is secured with two screws so even with double the weight they’ll stand firm. It’s hard to tell exactly what type of wood is used here, but this weighs almost 100 lbs when assembled. So regardless of the wood choice this is not tipping over. It does come with bench storage so you can flip up the bench and keep little accessories in there like umbrellas or snow boots. The full-length mirror is another nice touch so you can do an outfit check before heading out the door. Now onto the biggest downside: the assembly. I would not call the install instructions “clear”. They are pretty straightforward but the setup is not so easy because of so many different parts. You might find yourself lost midway through and re-doing steps over again. It can take a few hours to get this thing assembled so you should be prepared for that. But as far as quality goes I really cannot complain. Once this is put together you’ll love it and it’ll surely get a lot of use. Make sure to also check your room against this darker wood to see if it’ll blend. This should work fine so long as you don’t have too many lighter wood items in the same space. Some people want the full length mirror but don’t want the wider hall tree design. The Belham Living Carlisle Hall Tree fits that description to a tee. It’s only two feet wide but still spans the typical 6 feet tall from floor to top shelf. The full length mirror is gorgeous, albeit kinda thin, but still totally usable. And this one comes with its own storage bench too so it really has a mix of everything. Because it’s a smaller unit you can’t cram a bunch of stuff into the storage bin. 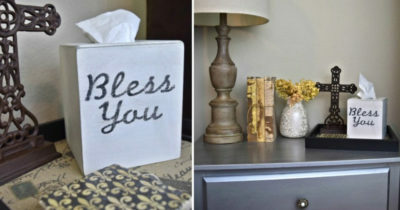 Yet it is big enough to keep small accessories or winter items for the cold weather. Part of the design uses solid pine wood which is firm and pretty heavy. This wood is used mostly near the legs & the bottom of the unit so it doesn’t risk tipping over. Other areas use some mix of particle board or something similar with an ash wood veneer. The finish is stunning and really should mix well into any space. But if you’re buying a hall tree to hang a bunch of coats this may not have enough room. It only has two hook areas and while they are double hooks, they still don’t feel as spacious compared to other models. I wouldn’t even count the 2nd hooks as useful for coats because they’re so small. They’d really do better with keys or hats. Once again I’d consider this a specialty hall tree for a specific audience. If this checks all the boxes of what you need in a hall tree then you’ll adore this piece no question. Here’s a similar alternative to the prior hall tree, this one with a much darker finish and a smaller mirror. The Belham Living Richland model almost clones the design of the previous model, not to mention it’s from the same manufacturer. 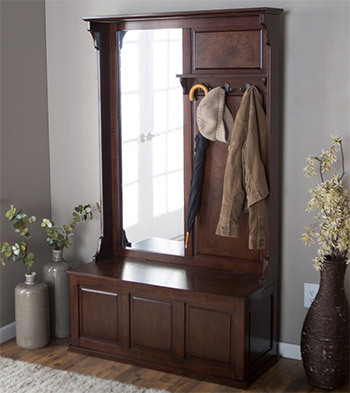 This also comes with a storage area but prioritizes hook space over the mirror. With this one you get three double hooks and the hooks themselves are much thicker. I still wouldn’t say you can use all 6 for coats easily, but compared to other small hall trees this one seems a lot more accommodating. Near the top of the unit you’ll notice a four-paned mirror. This is great for checking your face for unsightly cosmetic issues but it’s not great for much else. This unit measures just about 6 feet tall so the mirror sits slightly below that, maybe around 5.5 feet off the ground. Probably won’t be much use to shorter people and it’s really not all that useful compared to full-length mirrors. Still everyone looks for different things in their furniture so this smaller rectangular mirror might be just what you’re looking for. The bench storage has a small space for accessories and it’s also easy to open. There’s a small groove to help grip the lid and it feels surprisingly light. Setup is a breeze although some of the dowels & screws can feel a little cheap. I do not think this would cause any problems with breakage or cracks in the furniture at all. It’s just something to note before buying since this probably isn’t top of the line(what is these days?). I’ve seen great stuff frome Belham Living so if this design suits your fancy I think you’ll be pleased. There aren’t as many corner hall trees out there but they do exist. These are designed with a back 90° angle so they’ll fit snugly into the corner of any room. While researching I did find quite a few models that stood out. My pick for the best corner hall tree is the Prepac ESCC-0606-1 since it comes in so many different colors, offers plenty of storage space, and has bottom cutouts to line up snug against baseboards. But I’ve listed my top three corner-style hall trees here so let’s dive in and see what they’ve got! When it comes to corner hall trees you’ll want enough space to actually hang your coats, but not so much space that it takes over the room. The Prepac ESCC-0606-1 is my top pick for a corner unit because it meets all the best criteria. The hooks are study enough to hold pretty much anything and the unit overall feels heavy enough to support a family’s worth of outerwear. Got bundles of winter coats? No problem. You can even hang 8 of them if you use the double hooks for coat storage. Plus there’s a good amount of shelving on this thing with a small seating area, a couple storage spots under the seating place and a very top shelf for little knick-knacks. The under seating area even comes with an adjustable shelf so you can change the size of that space at will. Build material is composite wood and it feels incredibly sturdy. It’s built to last and while this is an affordable model it certainly doesn’t feel cheap. Oh, and did I mention this comes in three different colors? No matter what interior style you have this corner hall tree offers a color to match. But is this the best tree for you? It really depends if you’re looking for a corner model or if you need this much extra storage space. 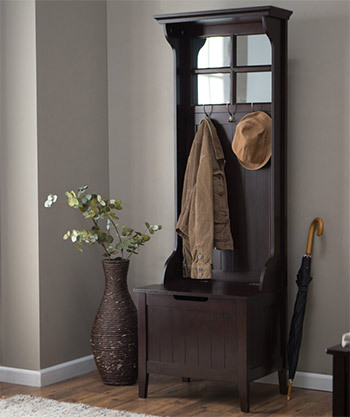 Coaster Home Furnishings also makes some great pieces and this corner hall tree is one of their best. I mentioned one of their designs earlier in this post, but that one’s a lot more experimental. 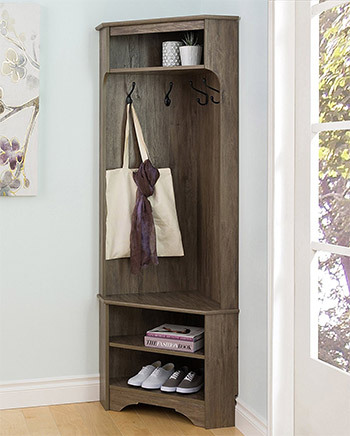 This hall tree follows closer to the norm with a wood design and plenty of storage shelves. Most corner hall trees are limited for space so they usually have 4 hooks at most. This one is no different but the hooks feel just as sturdy as any other model. The design is not exactly solid wood, possibly MDF or a combination of something else. But the actual piece itself feels very sturdy with the final assembled hall tree weighing about 100 lbs. Assembly is pretty simple and you should be able to cram this into any corner of your home or apartment. It’s really one of the best hall trees with a corner design because it uses the natural wooden paneling all over the exterior. And much like the previous item this one comes in multiple colors, just not as many options(either white or black). I wanna toss in the King’s Brand Entryway Rack because it functions much like a typical hall tree. But this feels more like a coat rack with expanded features. This comes with 6 total coat hooks which is more than most corner hall trees. The design is all metal with a small microfiber seating area in the middle. As a whole the rack does feel stable but this depends how much you’re storing. It’s good to keep something on the bottom shelf to avoid any top heaviness. One thing I don’t like is the ornate metal styling you see throughout. This whole unit is full of these swirly patterns almost like what you’d see in garden decorations or fences. My thoughts: this piece really works for people who like this type of design. Anyone else will find it too flimsy, too girly, or just too not traditional for a hall tree. Yet for the price it’s one of the most affordable corner units out there and it’ll do a heck of a job keeping your coats off the floor. When you’re on a budget it can be tough knowing what’s a quality purchase. My recommendation for the best budget hall tree is the eHomeProducts black metal hall tree. Yes it is pretty small and no it doesn’t have extra top shelving. This would be an issue for anyone who prefers the larger hall trees. 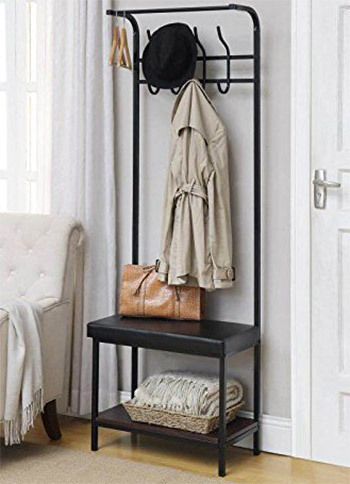 But generally speaking this model is fantastic for one or two people to hang coats, hats, scarves, purses, keys or similar items. You could even use this as a makeshift drying rack for clothes that can’t go in the dryer. A good majority of this unit is metal with a bonded black leather seating area. There’s also one shelf underneath the seat which uses a hardwood base. It’s really a good mix of materials but the whole thing looks like a dark piece of furniture. Each hook is designed as a double hook so you get a larger one on top and a smaller one(with more curvature) on bottom. If you hang too much stuff then it’s likely to have a bit of a sway. This hall tree is sturdy but also not the sturdiest I’ve found. Keeping something on the bottom shelf places more weight towards the bottom so that’ll counter any potential swaying. And really the problem doesn’t come from the hooks, but rather hanging a lot from the very top of the unit. As long as you don’t have kids messing around with it or throwing things over it carelessly you won’t have problems with stability. Setup is simple and you really can’t beat the cost. 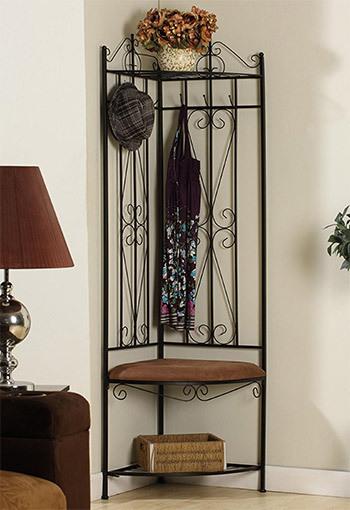 For what you get this hall tree is an excellent choice for new apartments or smaller hallways. Deciding on furniture is never easy because each home is slightly different and each person’s tastes are different too. But considering price, size, storage, and build quality I’m casting my vote for the Homestar 3-shelf hall tree as the best overall choice. Yet if you want a mirror or bench storage then this won’t fit your needs. Hence why I organized this list of the best hall trees into one ultimate guide—you’re bound to find something here if you know exactly what you want and how much you can spend on it. What Is An Undermount Sink? What Is A Curio Cabinet?